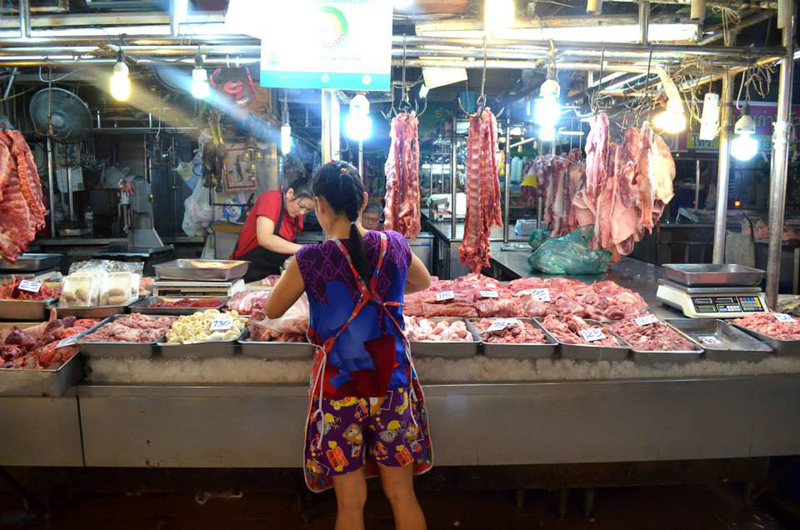 A Thai girl unloads a bag of liver at her butcher stand in a massive market in northern Bangkok. One of the best things about travelling in Thailand is the food. In city centres, you can find street food at any hour of the day or night. The selection of toppings offered for most Thai dishes is indicative of the variety of flavour combinations in a Thai meal. To top off your dishes, there will usually be a tray of toppings including sugar, fish sauce, dried chilies, and vinegar with chilies in it. At first I wondered why they didn’t just put all these spices in the food to begin with, but by the end my trip I was rationing out portions of all of the above at every meal. The medley of flavours is different with every dish, which means you could have pad thai every day for a month without having it the exact same way twice. 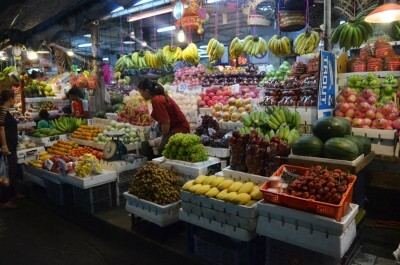 Like most other things, food in Thailand is very cheap, as long as you shop for things that Thailand doesn’t have to import, like milk and cheese. Avoid any food that is not traditionally Thai. Western food will not be nearly as good as back home, no matter how comforting it might be to see on the menu. While still very affordable, non-Thai food can cost up to four times as much as a similarly-sized Thai meal. places to eat. 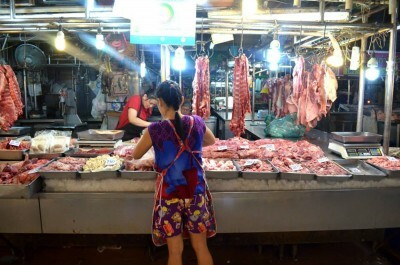 There is a large population of Chinese immigrants in Thailand, and their food has fused with traditional Thai fare to yield delicious results. Something to be wary of when it comes to street vendors is cleanliness and health. A good way to judge food quality is simply by seeing how many other people are eating there. Keep an eye on your food to make sure your meat isn’t undercooked. My favourite street food is Thai sour sausages. I once bought some from a vendor and realized too late that the woman was handling both raw meat and money at the same time. It’s a good idea to slowly introduce street food into your diet rather than relying on it immediately to give your body a chance to get accustomed to it. I ate more dessert in Bangkok than I ever did in Canada. The appeal of ice cream grows exponentially when the temperature never dips below 25 degrees. Although we rarely adhered to this, a lot of the desserts on offer are meant to be shared. Where here dessert is more of a treat, in Bangkok it became a social regularity. In an unexpected twist, Thais most often eat bread as a dessert, not for breakfast or as a side dish. A thick slice of warm white bread topped with a mountain of Milo chocolate powder or some green custard is cut into pieces and eaten with toothpicks. If you’re lucky enough to find a translated version of a menu, the descriptions are often vague. I ordered a dish with rice and fried catfish, and instead of getting a whole fish as I expected, I ended up getting what would happen if you broke the fish down into itty bitty pieces and deep fried them. This resulted in what looked like a bird’s nest or a deep fried savoury version of cotton candy. If you have any dietary restrictions or don’t do well with spicy food, picking a random item off the menu without knowing what it is is probably a bad idea, but otherwise it can lead you to trying things you never expected.